Designed completely free-standing on its own integral base; Amon Ra features ground granite and stainless steel construction combined with a large Twin Screen digital camera system with full industrial PC architecture – these electronics and software provide operational and functional simplicity that is second to none. The high precision spindle system is fully interchangeable and utilises a one piece cartridge with full mechanical tool clamping (pneumatically drawing the tool pullstud into the taper cone) - eliminating the need for adaptors and the errors associated with their use. The construction of this system has to be 'seen to be believed' and is more akin to a machine tool spindle than a tool presetter spindle! All axis movements on the Amon Ra (like it's sister the 66B) are servo controlled with absolutely no operator contact with the column. This drastically increases machine accuracy and repeatability over similar machines which incorporate the movement via a manual handle mounted on the column. Integrated within the innovative software package is a complete tool management system and network port. 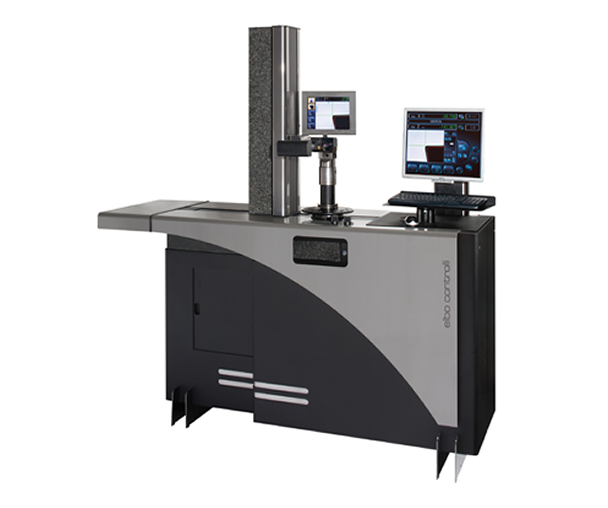 Working via your DNC system Q-Presetter TDM Software converts measured tool data into CNC code for direct loading into the machine controller and associated tool offset pages. Further capabilities include the ability to import and export .DXF CAD profiles for detailed checking and comparison on the twin screen camera system. Machine structure in stainless-steel offering high mechanical resistance and long life, floor mounted with self-levelling supports in non-deformable steel, equipped of adjustable supports for monitor, keyboard and mouse with cable conduits. Base and column made of natural granite: linearity max error 2 µm/Mt - certification with Taylor Hobson res.1 µm/Mt. electronic millesimal level. ISO / BT / HSK / VDI / CAPTO etc. Interchangeable rotating spindle-holder (to be specified) max run-out error < 2 µm. Universal mechanical tool clamping managed via software. Pneumatic-mechanic brake of the spindle-holder rotation with radial compensation of the clamping force: no axis angular run error. Constant load Archimedean spiral spring (as opposed to a mass counter-balance system). TFT screen colours 10,4", magnifications 13X/26X (on the column support). C-MOS sensor 1,3 Mega pixels, USB 2 link High speed Area framed image 12,8 x 10 mm (4 times as great as the standard). LCD Monitor colours 19" TFT SXGA, magnifications 15X/30X (on the adjustable support of the machine base). Celeron M® Processor on Industrial Main Board architecture. Operating system : Ubuntu LINUX. tool set compiler and Post Processor universal generator. CNC machine origin management and adapters. Tool list creation and/or single tool, even multi-cutting. Automatic change of CNC machine origin allocation. Reading/writing module on magnetic chip code-holders (Balluff for example, hardware not included). Tool images shooting in inspection and its rescue in graphical format. Doublet lenses at low F/Number in order to eliminate the error of the clearness circle. Episcopic illuminator with ring lens and red leds; diascopic illuminator with red, puntiform light led. Anti-dust cover provided for when not in use.